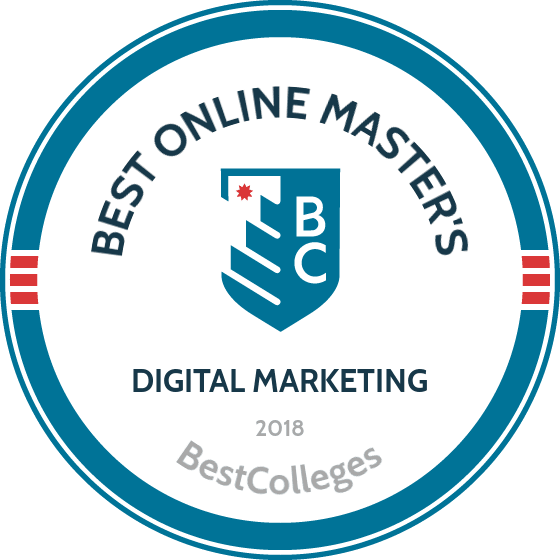 WHAT ARE THE BEST ONLINE MASTER'S IN DIGITAL MARKETING PROGRAMS? What Else can I Expect from an Online Master's in Digital Marketing Program? Modern information sources are primarily online, and internet marketing is crucial to reaching consumers and building brands. Graduates with a digital marketing degree work as digital marketers, online advertisers, and social media specialists to analyze, research, and create compelling content within the digital sphere. Opportunities in internet marketing are projected to grow as companies shift advertising dollars to online efforts. According to the U.S. Bureau of Labor Statistics, the demand for advertising, promotions and marketing managers will grow by 9% over a 10-year span, and McKinley Marketing Partners recently reported digital marketing and creative services to be top requirements for new hires. An online marketing degree provides the tools and knowledge to compete in this evolving field. Though not required for most online marketing degree programs, related work experience--such as a sales position, an internship at a tech company, or freelance content creation--will help your application stand out. The strongest applicants have an undergraduate degree in marketing or a related discipline. CAN I WORK WHILE I COMPLETE MY ONLINE MASTER'S in DIGITAL MARKETING? Yes, online MA in digital marketing programs are typically structured to accommodate busy schedules. Such programs allow students to work while pursuing their degree. And if you're currently working in the same field, you can apply classroom studies to your job. Internet marketing degree programs offer rigorous but flexible curricula, and most can be completed on a full-time or part-time basis. A flexible online master's program allows you to earn your graduate degree without putting your life on hold. Most online programs allow students to complete their degrees at their own pace. A master's degree in internet marketing results in higher salaries, and by earning your degree online, you save money on traditional costs such as room and board. The University of Illinois' iMBA program was one of the first fully online MBA degrees available. Today, its “stackable” format, low tuition rates and concentration options make it a popular option for online learners. The digital marking concentration covers strategic marketing concepts and provides the tools necessary to create targeted digital campaigns. The curriculum is divided into three-course blocks, which combine to form practical “specializations.” Students complete six specializations--four core blocks and two digital marketing blocks--for a total of 72 credit hours. Most students complete the comprehensive program in two to three years. The first phase of the program is taught asynchronously, and the second phase includes live, interactive classes and three capstone projects, which give students hands-on experience and an impressive portfolio. Missouri University was one of the first technological learning institutions west of the Mississippi. Today, its customizable MBA program offers 15 elective options, which also fulfill a graduate certificate program. In addition to digital media and marketing, the 10 certificate options include human-computer interaction and user experience, electronic and social commerce, and mobile business and technology. The 36-credit, asynchronous program is ideal for adult learners; classes can be completed on a part-time or full-time schedule. Depending on the pace of study, students typically earn their digital marketing degree online in two to three years. Applicants must have a bachelor's degree, a GPA of 3.0 or better during the last two years of study, and a GRE score of at least 290. Temple University's MS of digital information in marketing degree is a 16-month accelerated program ideal for professionals with degrees in communications, public relations, journalism, and similar fields. This online marketing degree program focuses on using technology, such as social media, mobile platforms, and big data analytics, to guide marketing campaigns. Coursework emphasizes practical application methods, and a final capstone project allows students to demonstrate learned skills. The 30-credit program is taught synchronously in the evenings. Classes involve virtual teamwork and interactive professional development opportunities; members of the program's advisory council represent firms such as LinkedIn, Warby Parker, and Citi. Applicants without a marketing background must take a prerequisite marketing course. CUC's internet marketing degree is one of ten MBA degree options that can be completed entirely online. The 16-course program includes 12 core business classes, which each require a final project. The projects combine to form an electronic portfolio used to demonstrate skills to prospective employers. Specialization courses, such as digital strategy and planning, prepare students to use digital metrics to develop marketing strategies and to improve return on investment. Students may complete the program on a part-time or full-time basis, and hybrid formats are available. Applicants must have a bachelor's degree from a regionally accredited institution, a 2.85 GPA, and two recommendation letters. GRE scores are not required. All students pay the same affordable online tuition, regardless of state residency, and CUC promises each student's tuition will remain the same for the duration of the program. SMUMN's digital marketing degree teaches students to hone digital engagement through data analytics and storytelling--it's a business degree meant for writers. The 30-credit MBA social media management and marketing program includes courses such as quantitative decision making and corporate finance, which focus on management and leadership skills. Specialized courses, such as digital storytelling and ethics in social marketing, provide insight into effective brand management. Students complete a final strategic management capstone project, during which they work with a local organization to apply classroom knowledge and writing skills. Asynchronous classes and an 18-month accelerated schedule make this a popular program for working students. Applications are accepted on a rolling basis. Each student receives a free iPad, so the program is accessible even to students without computers. Messiah College, a small, private college in Mechanicsburg, Pennsylvania, integrates Christian philosophy with applied arts and sciences curricula. Its MBA in digital marketing is offered fully online in a flexible, asynchronous format. The program is designed both for recent graduates and to help working business professionals advance their careers. The 36-unit digital marketing degree program emphasizes transformative leadership skills. The program includes nine core business courses and three concentration courses in digital marketing, social media strategy, and marketing analytics. Students with non-business undergraduate degrees take prerequisite courses in accounting, finance, microeconomics, and statistics. Most students complete the program in two years. Transfer students may bring up to nine graduate-level credits, shortening completion time. The 64-credit program can be completed in an accelerated format, which requires students to take two courses simultaneously, reducing the program length to one and a half years. Students who choose to take one class at a time typically graduate in about 22 months. No GRE or GMAT scores are required to apply, but applicants must have an undergraduate degree from an accredited institution and a cumulative GPA of at least 2.75. SLU is one of the oldest Catholic colleges in Florida and has offered online education since the 1990s. SLU's MBA with a market research and social media analytics concentration balances foundational business knowledge with innovative digital marketing ideas. The internet marketing degree requires an equal number of core and concentration courses. Core classes examine topics such as human resource management and professional development, and concentration courses cover the latest in modern marketing methods. Rolling admissions and flexible, asynchronous classes make it easy for working professionals to earn their degree. SLU also offers credit for work experience and corporate job training. Active military personnel received discounted tuition. OCU, a nonprofit Christian school in Circleville, Ohio, offers a digital marketing degree designed to prepare students for careers as marketing managers. Concentration classes, such as psychology of marketing and digital marketing communications, emphasize the science and salesmanship behind successful marketing campaigns. Core classes explore foundational business topics, such as accounting, analytics, and legal and ethical concerns. The program requires a final capstone project, which challenges students to apply their learned skills. All students entering the 36-credit program take a one-unit course, graduate essentials, which provides an overview on writing, research, team collaboration, and communication skills. The program can be completed in as few as 18 months. Excelsior has provided distance education for more than 40 years--well before the internet. Excelsior's MBA with a concentration in social media management was one of the first digital marketing degrees offered entirely online. Students learn practical applications of current social media tools, and core requirements cover business topics, such as organizational behavior, quantitative analysis, and accounting. The 51-credit program comprises 14 core classes and 3 concentration courses. Transfer students may bring up to 24 approved credits from previous studies, and up to five foundation courses may be waived based on previous upper-level undergraduate study. Excelsior offers 60 scholarship options to make its online degrees even more accessible. A digital marketing degree prepares students for careers in online marketing, advertising, and promotions. In addition to field-specific skills, such as SEO and content marketing, students gain analytical, communication, and decision-making skills, while expanding their creativity. The curricula for internet marketing degrees vary by school, but below are a few courses common to most internet marketing programs. Search marketing: This course addresses the role of search engine optimization in successful internet marketing strategies. Students explore search engines, algorithms, pay-per-click ads, sponsored links, affiliates, and site optimization through keywords and metrics. Digital planning: Students learn how to develop, plan, and launch an effective digital marketing strategy. Students also learn to target an audience for a campaign launch and to analyze the four Ps of marketing: product, price, promotion, and place. Digital research: Students learn how to obtain analytics and metrics through methods such as A/B testing and how to apply this data to internet marketing campaigns. The course develops cognitive, analytical, and critical-thinking skills. Social media marketing: This course delves into the ubiquitous presence of social media in daily life and how to use social media to connect with consumers and partners and to build a brand. Students learn to leverage analytics and to create content that results in leads, recommendations, and increased audience sharing. HOW LONG DOES IT TAKE TO GET AN ONLINE MASTER'S IN DIGITAL MARKETING? Earning a master's degree in digital marketing typically requires two years, though accelerated internet marketing degree programs may be completed in as few as 12 months. Factors such as the program's learning model, the student's transfer credits, and whether the student attends full-time or part-time impact program length. Many marketing students pursue their master's degree directly following undergraduate studies, however transfer or experiential learning credits can significantly reduce completion time. Most internet marketing degree programs use either a cohort-based model or an individual model. In the former, groups of students complete the program together, from enrollment to graduation. Benefits of cohort learning include collaboration, networking, and peer support. Such a model requires a pace dictated by the curriculum's sequence. An individual-paced program, on the other hand, moves at the student's pace, allowing for flexible scheduling. While certification in internet marketing is not commonplace, professional associations do offer certifications. A bachelor's degree is required for most marketing, advertising, and promotions jobs, so a master's degree separates professionals from the competition. However, with the digital market growing fast, certification may be an added advantage. Professional Certified Marketer (PCM): Offered by the American Marketing Association, the PCM for digital marketing represents mastery in areas such as metrics and conversions, social media, SEO, and content marketing. The two-hour exam comprises 120 multiple-choice questions and requires a score or 80% of better. The cost of exam is discounted for AMA members. Online Marketing Certified Professional (OMCP): The Online Marketing Certified Professional Association, based in San Francisco, accredits trainers and courses that meet OMCP standards. Through these courses, professionals may work toward certification, which demonstrates up-to-date digital marketing skills in accordance with industry standards. WHAT'S THE DIFFERENCE BETWEEN AN MA IN DIGITAL MARKETING AND AN MBA IN DIGITAL MARKETING? For those forging careers in internet marketing, an advanced degree enhances your marketability. An online graduate degree in marketing gives professionals a major advantage in a field that values experience and established knowledge. An MA or MBA in digital marketing will demonstrate to employers the background necessary to build a digital presence. The two degrees differ in curricula and prerequisites. Students who choose an MA in digital marketing typically apply immediately after earning a four-year degree in marketing or a related area. Those who choose the MBA in digital marketing tend to be older, with professional experience in the field. An MBA is a path to career advancement and delivers broad business knowledge. Curricula for MA in digital marketing programs focus on marketing theory, technique, and concepts, from consumer behavior to search engine optimization. Accreditation illustrates that an institution or program meets standards set forth by an accrediting agency. Regionally accredited schools have earned the gold standard of accreditation and are recognized by both the U.S. Department of Education and the Council for Higher Education Accreditation (CHEA). Credits earned through schools accredited by any of the six regional agencies are easily transferable. Nationally accredited institutions must undergo review every three to five years to ensure standards are maintained. National accreditation is typically given to technical or distance learning programs. Credit earned through a nationally accredited institution may not be transferable to a regionally accredited school, and federal aid may not be available. The U.S. Department of Education executes educational policies for the nation, implements new legislation, and establishes and administers federal aid to students. The ED also awards accreditation through six regional accrediting bodies. To review all accredited schools and programs in the U.S., visit the DOE website or the CHEA database. A recent year-end study by LinkedIn found that two of the top five skills leading to employment are in internet marketing: marketing campaign management and SEO/SEM marketing. A 2017 report from McKinley Marketing Partners found that 56% of surveyed companies want employees with digital marketing skills. Specialized digital marketing skills are especially in-demand, with hiring for skills, such as content creation and social media, above average. However, hiring for classic marketing skills, such as direct response and project management, are below average. As the digital marketing field grows, opportunities for those with an internet marketing degree and online skills are multiplying. Experience increases salaries across internet marketing positions, with many entry-level positions already surpassing the national median of $57,000. The table below shows median salaries for digital marketers and specialists at different stages of their careers. A digital marketing degree qualifies professionals for nearly every job in the internet marketing field, from digital strategist to social media marketer. An advanced degree also creates a path to advisory or leadership roles, such as online advertising director or director of digital sales. As companies shift advertising dollars to digital platforms, internet marketing skills are increasingly valued. Analysts study market conditions, helping companies determine the best approach to campaigns and product launches. They forecast potential trends and provide insight into consumers. Top research positions may require a master's degree. Social media specialists or managers act as liaisons between companies and the public. Through social media platforms, they communicate with the public, offer a channel for feedback, and build brand recognition. With the help of creative, sales, and finance teams, marketing managers plan and implement advertising and promotional campaigns to generate interest in a business, organization, product, service, or cause. Content creation is an important part of building an online presence and delivering messages to consumers and partners. Writers in digital marketing use SEO, metrics, and communication skills to help businesses and organizations build an audience and establish consumer trust. A professional organization functions as a representative body for a specific profession. Its members promote their field and help each other grow professionally. A professional organization can be invaluable for students and recent graduates, providing networking and employment opportunities, as well as seminars, CE courses, and workshops. In addition, many professional organizations offer scholarships. Formed in 1937, the AMA has witnessed the transformation of marketing and continues to adapt to business needs, which are now largely digital. With more than 30,000 members, the AMA helps marketers and academics succeed. Founded in 2004 as the Web Analytics Association, the DAA's mission is to advance the use and understanding of data and to improve the digital world. The IMA offers free membership for professionals in sales, marketing, programming, and creative development. Members from more than 75 countries work to establish global standards for internet marketing. Funding a two-year master's degree in digital marketing is often more manageable than financing a seven-year PhD program. Professional organizations and employers may offer financial support through scholarships, internships, or work education programs. Explore all financial options, including federal aid and private programs. Note that federally-backed loans, such as the Stafford Loan, carry low interest rates for students. Complete the Free Application for Federal Student Aid (FAFSA) to determine your eligibility.